I can’t believe how much love there has been for the #travellingnotebooks so far. Me and Emma (aka @Oh_Gosh) can’t believe how much love there has been for the ‘Travelling Notebooks‘ so far. We have people signed up to the project from all over England and the United States, from Scotland, Ireland, France, Jordan, the Czech Republic and now Australia. Not only do we have loads of people signed up, but we have some amazingly talented people signed up. 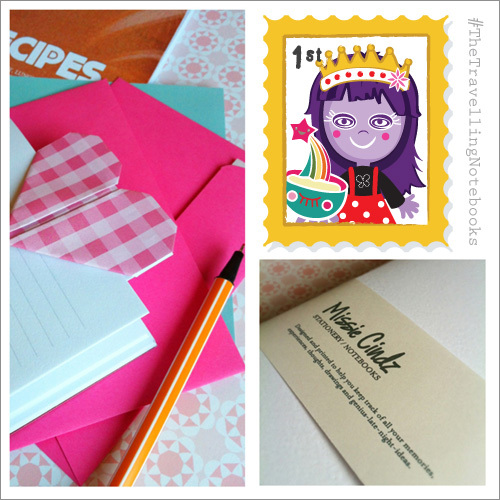 We’ll be posting out a copy of the Missie Cindz Recipe, Ready and Snap notebooks to our first subscribers the week commencing the 27th August! We will also be starting to email the first recipients with the details of where their notebook will be going next that week too (or maybe even before!). As we’d like this to be a community project it would be lovely if you could get involved and engage with your travelling notebook partner; check out their twitter feed – we have set up a Travelling Notebookers twitter list so you can find your notebook partner there; find out their blog, their Instagram or Flickr page. Maybe mention the person you sent it to when you blog, tweet or post your pictures (we all love seeing lots of photographs!). To keep the books moving, can we suggest that you try and complete your pages (max. two pages) and have the book posted within a month. We don’t have any MI5 style fancy tracking devices, so we’re trusting you to send the notebook on – let’s see how far the books can really go before finally returning back to me or either Emma! And if you tweet/instagram your pages, tag them with the #travellingnotebooks or #snailmailisnotdead. If you’d like to join the Travelling Notebooks Project, please fill in the ‘Sign up‘ form on the main our main Travelling Notebooks blog.